For the Dharmaśāstra text traditionally attributed to Yājñavalkya, see Yājñavalkya Smṛti. Yajnavalkya (Sanskrit: याज्ञवल्क्य, Yājñavalkya) of Videha (fl. c. 7th century BCE) was a rishi and philosopher of Vedic India. He was one of the first philosophers in recorded history, alongside Aruni. In the court of King Janaka of Mithila, he was renowned for his expertise in Vedic ritual and his unrivaled talent in theological debate. He expounded a doctrine of neti neti to describe the universal Self or Ātman. He later became a wandering ascetic. His teachings are recorded in Shatapatha Brahmana and Brihadaranyaka Upanishad. He is traditionally credited with the authorship of Shatapatha Brahmana (including Brihadaranyaka Upanishad]l), besides Yoga Yajnavalkya and the Yājñavalkya Smṛti. He is also a major figure in Upanishads. According to traditional accounts, Yājñavalkya was son of Devarāta and was pupil of sage Vaisampayana. On one occasion, Vaisampayana got angry with Yājñavalkya as he found that he argued too much and was abler than the other students. The angry teacher asked Yājñavalkya to give back all the knowledge from Yajurveda that he had taught him. Complying with the demands of his Guru, Yājñavalkya vomited all the knowledge that he acquired from his teacher in the form of digested food. Other disciples of Vaisampayana took the shape of partridges and consumed the digested knowledge because they were very eager to receive it. There is a metaphor here of knowledge in its simplified form, without the complexities of the whole, but in the simplicity of its parts. The Sanskrit name for partridge is Tittiri. As the Tittiri(partridge) birds ate this Veda, it is thenceforth called the Taittirīya Yajurveda. It is also known as Krishna Yajurveda or Black-Yajurveda on account of it being a vomited substance. 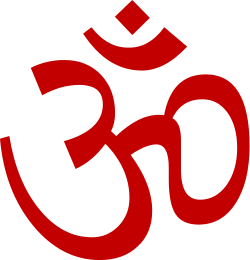 The Taittirīya Samhitā thus belongs to this Yajurveda. Then Yājñavalkya determined not to have any human guru thereafter. Thus he began to propitiate Sun God, Surya. 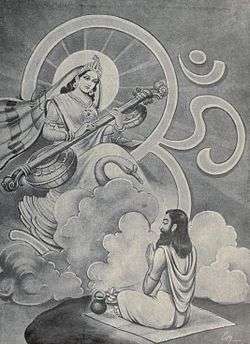 Yājñavalkya worshipped and extolled the Sun, master of the Vedas, for the purpose of acquiring the fresh Vedic portions not known to his preceptor, Vaiśampāyana. The Sun God, pleased with Yājñavalkya's penance, assumed the form of a horse and graced the sage with such fresh portions of Yajurveda as were not known to any other. This portion of Yajurveda goes by the name of Śukla Yajurveda or White-Yajurveda on account of it being revealed by Sun. It is also known as the Vajasaneya Yajurveda, because it was delivered by Sun who was in the form of a horse. The rhythm of recital of these vedas is therefore similar to the rhythm of the horse's canter and distinguishes itself from the other forms of veda recitals. In Sanskrit, the term "Vaji" means horse. 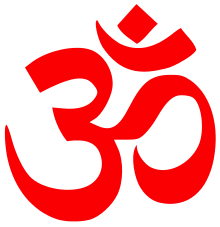 Yājñavalkya divided this Vajasaneya Yajurveda again into fifteen branches, each branch comprising hundreds of Yajus Mantras. Sages like Kanva, Madhyandina and others learnt those and Shukla Yajurveda branched into popular recensions named after them. It is important to note that within the hierarchy of Brahmanas, certain sects believe in the Krishna Yajurveda while others practice from the Shukla Yajurveda. Yājñavalkya married two wives. One was Maitreyi and the other Katyaayanee. Of the two, Maitreyi was a Brahmavadini(one who is interested in the knowledge of Brahman).The descendant sects of Brahmans are the progeny of first wife Katyaayanee. When Yājñavalkya wished to divide his property between the two wives, Maitreyi asked whether she could become immortal through wealth. Yājñavalkya replied that there was no hope of immortality through wealth and that she would only become one among the many who were well-to-do on. When she heard this, Maitreyi asked Yājñavalkya to teach her what he considered as the best. Then Yājñavalkya described to her the greatness of the Absolute Self, the nature of its existence, the way of attaining infinite knowledge and immortality, etc. This immortal conversation between Yājñavalkya and Maitreyi is recorded in the Brihadaranyaka Upanishad. 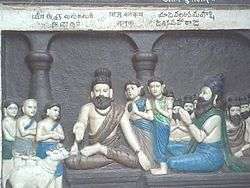 Wisdom of Yājñavalkya is shown in Brhadaranyaka Upanishad where he gives his teachings to his wife Maitreyi and King Janaka. He also participates in a competition arranged by King Janaka about the selecting great Brhama Jnani(knower of Brahman). His intellectual dialogues with Gargi(a learned scholar of the times) form a beautiful chapter filled with lot of philosophical and mystical question-answers in Brhadaranyaka Upanishad. He was then praised as the greatest Brahmajnyani by all sages at the function organised by king Janaka. In the end, Yājñavalkya took Vidvat Sanyasa (renunciation after the attainment of the knowledge of Brahman) and retired to the forest. ↑ Ben-Ami Scharfstein (1998), A comparative history of world philosophy: from the Upanishads to Kant, Albany: State University of New York Press, pp.62-65. Note: Scharfstein estimates Yajnavalkya's date as approximately the 8th century BCE, possibly earlier or later.